It seems like many cookbooks lately fall into one of two categories — beautiful OR useful. This is one of the rare exceptions, which is both a beautiful book and a useful cookbook, too. I lived and worked in the Deep South for years and, wow, I really miss their wonderful foods. Unfortunately, I didn’t learn to make many of them while I had the chance. 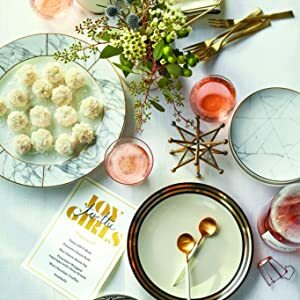 So I was delighted to see this wonderful book with menus based around a wide variety of events, parties, and gatherings. The recipes are versatile and truly appealing to, well, anyone, regardless of whether they’re familiar with the South or not. So the book is divided up into six main sections, including a “Hosting Handbook” (very helpful) and chapters titled: “Teas, Coffees, and Receptions,” “Brunches and Luncheons,” “Come By for a Drink, Y’All,” “Cookouts,” and “Celebrations and Dinners.” Each section is divided up into a half dozen specific menus/events, which include wide-ranging events, such as “Impress the Boss Dinner,” Christmas Night Feast,” Backyard BBQ,” “Nibbles & Nosh,” “Welcome Tea,” “Garden Club Luncheon,” “Tailgate,” and “Lowcountry Boil.” The recipes include both classic Southern recipes, like Deviled Eggs, and Beef, Cheese, and Chocolate Fondue recipes. There are also newer recipes with a Southern spin, such as Avocado Dip (with bacon) or Farmers’ Market Pasta Salad. All of those we’ve tried we found to be truly delicious, not difficult, and a huge help to serving groups large and small, formal and casual, family or guests. What an excellent cookbook! Snowballs are so fun and festive during the holiday season. These make adorable teachers’ gifts or sweet treats for the mailman or your favorite neighbor. Package them in clear plastic boxes and tie them with a festive ribbon. Elizabeth Heiskell also makes them for her annual Joy to the Girls party in celebration of her closest friends. Hands-on: 45 minutes. Total: 15 hours, 45 minutes, including 12 hours chilling. Serves: 15. 1. Beat the chocolate and cream cheese at medium speed with a heavy-duty electric stand mixer until smooth. Add the crushed cookies, coconut rum, and salt, beating just until blended. Spread in a parchment paper-lined 9-inch pie plate; cover and chill 2 hours. 2. Shape into 1-inch balls (about 2 teaspoons per ball), and place in a single layer in a parchment paper-lined jelly-roll pan. Cover and chill 12 to 24 hours. 3. Roll the balls in coconut; chill 1 hour before serving. Refrigerate in a single layer in a container up to 1 week.